In July 1776, the eyes of the world were on Philadelphia. A quarter of a millennium later, the world could turn to Philadelphia for an entirely different reason — the 2026 FIFA World Cup. With the 2026 tournament finally handed to North America, Philadelphia can dream of the moment eight years hence when the city welcomes world football. Now, Philadelphia hasn’t yet been chosen as one of the 13 American cities who’ll host matches. Steven Goff recently handicapped the possible tournament venues, saying that Philadelphia is a “contender” that faces an “uphill fight” with Boston, New York, and Washington all nearby. Which, well, fair enough. With the final list not set to be chosen for at least another two years, though, it’s useless to fret too much about it now. What we do know is that the chance to host the World Cup is unique in Philadelphia’s history. Philadelphia has never hosted the Olympics. Nor has it hosted any World Cup matches, getting passed over in 1994. The city’s never even hosted the Super Bowl (though we have the next best thing). Bringing the World Cup to Philadelphia would be a tremendous moment for the whole Delaware Valley, as both an opportunity for tourism and a monument to city pride. While there are dangers of welcoming international sport to town — look at how the Olympics treated Athens, Greece — Philadelphia is well-positioned to minimize those risks. There’s already a suitable stadium (the Linc), places for team base camps (the Union’s complex and possibly Penn to name a couple), and plenty of accommodations. If the cost of bringing the World Cup to town is some minor upgrades to SEPTA, I think few in the area would turn down that deal. In short, it’s a terrific opportunity for the city and the region. But, the opportunity is there for the Union, too. We often focus on the day-to-day minutiae of the team — who’s in form and who’s not, which players the club will sign, and how many goalkeepers one team can have. We’re focused, in short, on what moves will help the club win the next game. When you take the bird’s-eye view of the franchise, it’s clear there’s some danger of stagnation. 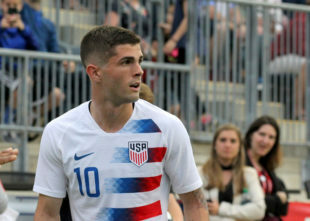 The Union have come through a period in which they lacked proper facilities, a professional front office, and an adequate youth development system. They now have all three, but the product on the field is still mediocre, and fan interest is, if not waning, at best holding steady. The Union haven’t managed to live up to the expectations of their die-hard fans, while failing to be competitive or interesting enough to attract new fans. Bringing the World Cup to town, though, is a once-in-a-generation event. Without the 1994 World Cup, after all, MLS as we know it would likely not exist. Three sold-out matches at the Linc, plus the attendant pomp and circumstance, could raise public awareness of the Union in unprecedented ways… if they’re ready for it. In other words, the Union need to be in a position to capitalize. Maybe the prospect of a World Cup will convince Jay Sugarman to open his tight pockets and invest real money in the first-team squad. Maybe it’ll convince his inner real-estate mogul to sell the club to someone with deeper pockets, with his initial investment doubling or quadrupling in value. Eight more years of the same, though, won’t cut it. Two years to secure a spot as a host. Six after that to prepare for the world stage. It’s a massive opportunity for soccer in Philadelphia. Give the Union credit for a quality win over New York Red Bulls in the U.S. Open Cup. Even with slightly weakened starting eleven, the Red Bulls are one of the most dangerous teams in MLS, and the Union now have two results against them this season. Most importantly, the Union showed that they can get a win even with their young defenders — Auston Trusty and Mark McKenzie — off their game. With either woeful D.C. United or leaderless Orlando City waiting in the quarterfinal, the Union are well-poised to be in the final four of the Cup. It’s a great opportunity for a side whose MLS ceiling still looks to be scrapping for fifth or sixth place. There should be quite a bit of juice at Talen Energy Stadium on Saturday, with Sebastien Le Toux set to enter the club’s Ring of Honor. (Is anyone else unbelievably curious about where the “ring” will exist physically within the stadium?) It’s a big match for the Union on the pitch, too. The Union have dropped two straight matches in MLS, and will seek to return to winning ways heading into a cross-country road trip — they next play a dangerous LAFC squad that have yet to lose at Banc of California Stadium. It’s ridiculous that we still don’t know whether Haris Medunjanin will play on Saturday night. All indications from the Union are that they’re expecting additional discipline for his Hulk moment in the Atlanta match. How has MLS not managed to make that information public, over two weeks after the fact? Even if the Union know whether they’ll be able to access their Bosnian, the league’s failure to communicate publicly is evidence that it still has a long way to go with transparency. Agreed. Goff also brushes off the “would have to lay grass over the turf” as though it’s nothing. Such surfaces are often problematic, to say the least. Why would you do that when you have great natural grass surfaces like the Linc ready and waiting?? The only reason I see for us being left out is if they use geographic SPREAD as a criterion — in other words, space matches out geographically to give as many Americans possible the opportunity to go with the least possible travel burden. Then you could make the case that Philadephians are a quick hop from NYC and DC, so we’re giving matches to Boston instead to allow folks from New England easier access. I have no idea if this is considered a worthwhile criterion or not — I am just making this up. God help us if Sugarman still owns this team in 8 years. I don’t think they’ll be a fanbase left. Philadelphia’s stadium situation is better than Boston’s… errr… I mean Foxboro. Natural grass, a subway line, easy access to highways, and at least three training facilities within a few minutes. I thought for some reason there would only be 10 American cities chosen. 13 sites would be great for our chances. Picking the last 2 (or 5 – fingers crossed!) gets a little tricky. You have 4 other options in the Northeast with Philly, Boston, DC & Baltimore (those last two really cancel one or the other out) I do think the 250th Celebration does give Philly an edge, but the same could be said for Boston. Would it be weird to host a World Cup and not play in the nation’s capitol? With Chicago backing out of the bid, is Kansas City the only mid-west site? Does that give Cincinnati’s chance a boost? Nashville? – (kinda/sorta close to Atlanta). Does Houston get a bid if Dallas does? Miami or Orlando – in July?!?!? No way Edmonton gets it. Makes no sense. And the argument for Boston is Trump. I find it hard to believe they are favorites.